We are offering rubber mounting. We have more then 500 different type of Engine, Cabin Mountings and other rubber parts for several Car, Truck, Buses, Tractor of European, Japanese, American, Korean vehicles. These rubber mounting are available at market leading prices. An engine mount is the part that holds the engine to the body or to the engine cradle (sub-frame) of the car. In a typical car, the engine and transmission are bolted together and held in place by three or four mounts. - Size: As per client’s need. We only deal with foreign clients. Keeping in sync with the latest market development, we are engaged in providing a high quality range of Engine Mounting. Note: Products can be developed according to customer specifications with samples and/or drawings. 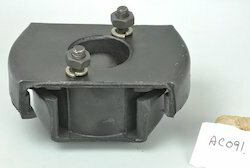 We provide "ENGINE MOUNTING" For JCB Earthmovers in best quality price. These high quality rubber, steel, high tensile studs and best bonding adhesives are used for increased performance and life of the mounts. We would like to introduce ourselves as an Exporter of Engineering Goods from India, specializing in Exports of Spares for Heavy Earthmoving Machinery, Automobiles & Agricultural Tractors. We are the prominent name in the market deal in manufacturing and supplying Engine Mounting. In order to fabricate this product, we make use the best quality raw material and contemporary technology in order to meet exact client’s requirements. Furthermore, the offered range is examined on various parameters of quality to eliminate very possible flaws. We manufacture a wide range of engine mountings that are widely by the our clients automobile industry. 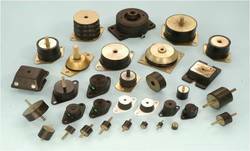 Made from superior quality raw materials, our engine mountings are durable and heat resistant. Engineered to perfection, these mountings are helpful in preventing the engines from shock excitation.